Dewsall Court is a bit of an enigma but in the best way possible. It is secretive and exclusive yet unpretentious and welcoming. Quiet and quintessentially English but the backdrop to many a fabulous party and host to many a guest with names you’ll likely recognise (if we were the type to name drop). Oh, alright we’ll tell you just one (and it’s a good one)! The lovely Ellie Goulding held her birthday party here. As in, the world-famous singer who performed at the reception of the Royal Wedding. We can only imagine how utterly stunning and fun her fête must have been. Oh, and it’s worth noting that the Duchy of Cornwall office is right next door and Chase Distillery (owned by the family behind Tyrrell crisps) is just down the road. Make no mistake, Dewsall Court is down-to-earth and its doors are open to everyone, but it isn’t for everyone. 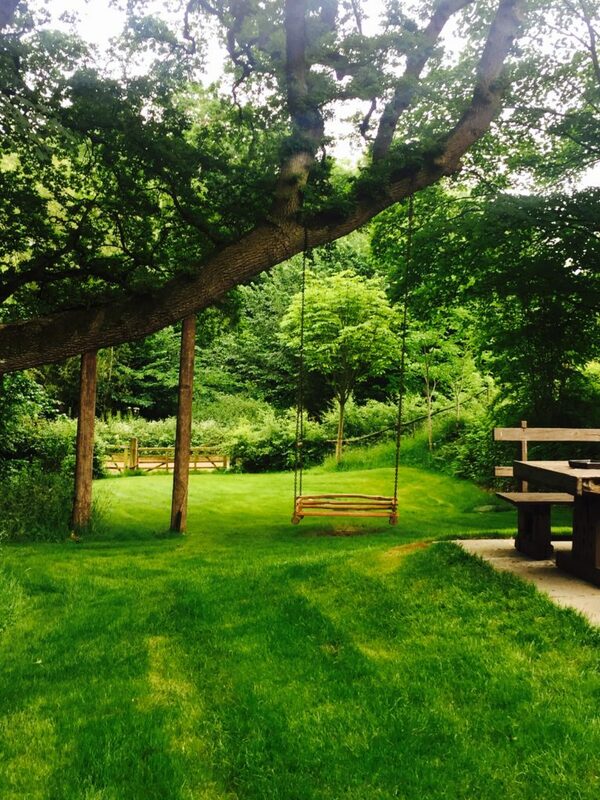 At Dewsall, you’re surrounded by lush greenery wherever you look! It’s one of those “Pra, you HAVE to write about this place…but it’s a little ‘shhhh’, like walking into the Secret Garden!!!”. It’s all so very special and I must admit, I’m rather reluctant to post out too much. It’s the kind of place you want to know about because you’re IN the inner circle, as opposed to seeing it plastered across magazines and flashing up on all social media channels. One minute you’re driving down a country lane and then you turn down a tinier, windier lane with the most glorious fields flanking you on both sides. With the sun blazing down, just as you sweep past the Duchy of Cornwall office sign, you spy a quintessential sign pointing you to Dewsall Court. And from there, you’re about to enter 15 acres of heaven. Within 10 seconds of driving up the beautiful driveway and catching our first glimpse of the magnificent home, we were excited. Only 2.5 hours from London, and even closer from Cardiff, Bristol, and Birmingham, it’s far enough to feel out of the city but not so far that you waste half a day just getting there. Dewsall Court is a house that oozes love, mystery, and impeccable taste perfectly in line with the age of the property (the house dates back to 1644) and whilst the family home has become an exclusive event venue, you wouldn’t suspect it at first (or even second) glance. The Robinson family acquired this property back in 1989 when it was in shambles and uninhabitable. You can feel how much love and effort went into making this the fabulous family home that it was for many years. Sam Vaughan, the daughter, says that she experienced 20 of the best years of her life at Dewsall and I believe that without a shadow of a doubt. There are still paintings of Sam, her brother, and the family scattered around the house, giving it that extra reassurance of how much the property is still in their hearts. Take a close look and you’ll spot names engraved into the lovely staircase. The aquarium-themed bathroom was hand-painted by Sam’s brother and the cracked leather seats have undoubtedly seen many, many hours of wear and tear with close friends and family. When the father passed away, the family decided to move out and commercialise the house whilst still keeping it very much a family affair. These days, you’ll see Sam flitting about, keeping an eye on the guests and property and generally making sure that all is right in the world of Dewsall. When I met her, the first thing that struck me was what a glorious character she is! Wild, free, and truly lovable, she took the time to make a cafetiere of coffee and entice us with the most hip-hating but lip-loving buns before scooting off to Glastonbury. All you will feel and see is that it was a place built with love to make it a proper, fun-packed family home which I can guess was full of laughter, entertaining, and dinner parties. There were probably good old shindigs with family friends and children growing up together; huge Sunday roast dinners and quintessential English games like croquet; and mischievous deeds like deciding that a pair of shades on a hog’s head on the kitchen wall would give it a little extra je ne sais quois! 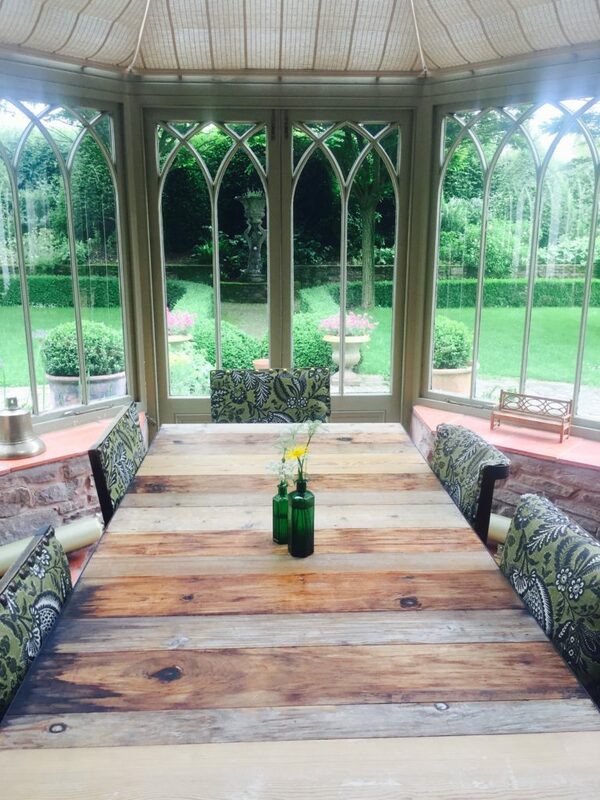 Grab your partner or a small group of friends, book your room and tickets for the dinner, and join an eclectic group of individuals who are keen to lap up the Dewsall Court dinner party scene and get close and cosy with an incredibly talented chef. 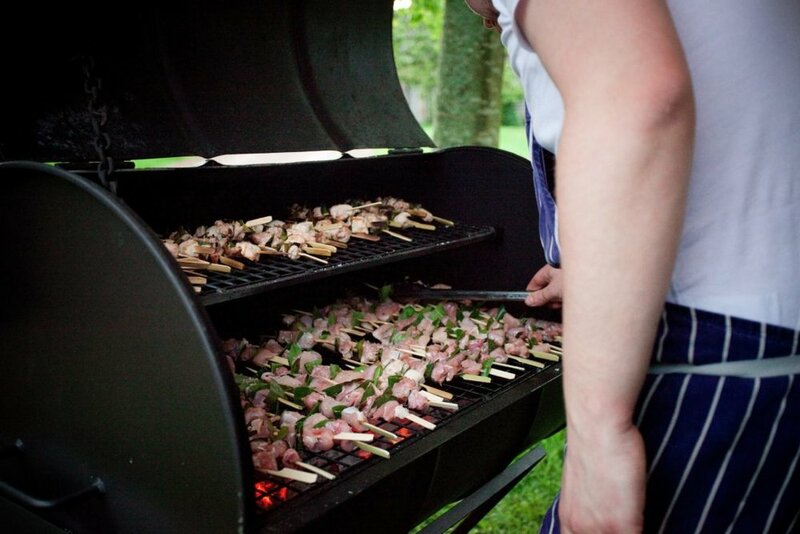 Or, if you’ve hired the whole place for the weekend and decide you’d like to throw a soiree for your guests on one of the nights, leave it to the Dewsall team to find a fabulous chef and put together a jaw-dropping dinner party experience. Think about it. You could drop a bundle eating at the trendy restaurant of the chef but wouldn’t it be oh so much better to have the chef prepping that meal in a home kitchen? It’s truly the perfect blend of going out but feeling like you’re at home and the atmosphere of the house will make you WANT to mingle with others. Past chefs have included Glynn Purnell, Cyrus Todiwala, Valentine Warner, Maria Elia, John Burton-Race, Sabrina Ghayour, and Margot Henderson, and that’s only a handful of the roster! During your stay, you can arrange for anything from brunch to afternoon tea to late night nibbles. Their menus are always centered around local seasonal ingredients and stylish yet unpretentious country house fare. Although they have a slew of menus from which you can choose, the talented team in the kitchen are happy to oblige with any custom menu requests. The house holds 8 bedrooms with an additional 2 in the barn, sleeping a total of 20. Make use of the family rooms and the full capacity is 27. Everything from the beautiful commercial kitchen to the 550k upgrade to the barn to the usual fire and safety requirements are done so subtly, they’re barely noticeable. It is still very much a HOME, first and foremost, which is probably what makes this place that much more alluring and inviting. Dine in the gorgeous Chinoiserie with its round table and silk wallpaper that was painted by 7 different artists. How? The less experienced started with the outlines and then the more experienced added to the details. This wallpaper can actually be removed but I say leave it up and soak in the whole Dewsall effect! The dining room seats 12 but just make sure you account for the 13th member, Grandma, who always joins in on dinner parties as she hosts. And she’ll likely be sipping on her favourite whiskey. This is where Dewsall Court shines. Whatever you want, they can do. You want a fish and chips-themed dinner party followed by yurts in the garden and archery? Done. You’re looking for a spiritual celebration in the church followed by a party in the barn? And then you want a celeb chef for a dinner party the following night? They’ll make it happen. Fancy getting married in your PJs over breakfast and then sprucing up for canapés, croquet, and a party in the afternoon? You got it. The point is, you create YOUR story within this magical property. They began doing weddings in 2010 with just 1 or 2 taking place that year. Now? They have 47 weddings booked for 2016! 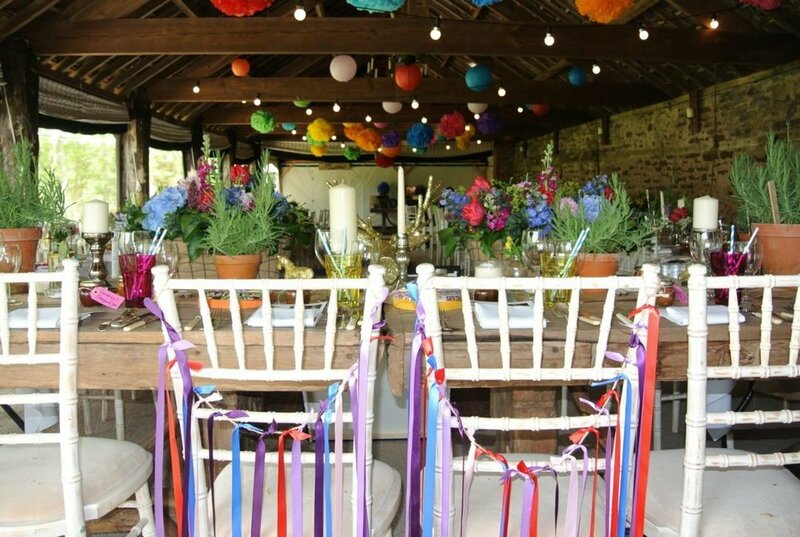 What used to be a rustic barn with trailer loos and a pop-up tent with no tap has been transformed (with thanks to that 550k investment) into a glorious event space. So far, the largest event they’ve hosted in the barn has been 180 people. They also have licensing throughout the property and have the most gorgeous little church down in the garden. This is not for the mainstream Hilton wedding crowd. Couples who choose Dewsall Court embrace the quirky and eccentric, always choosing to go off the beaten path. And off the beaten path it is, Dewsall Court. You’ll be well looked after by one of the event managers, like Emma who we had a chance to meet. She’s super fabulous with a motivation that’s positively addictive and whose parents no doubt partied with Sam’s parents back in the day before she returned from travelling and grabbed this opportunity! It just might be the best job in the world with such cool offices in the gardens! Of course, weddings aren’t the only special events that take place here. Commercial companies such as eBay, Hitachi, and Land Rover have all lapped up the goodness of Dewsall Court for their teams and top-tier staff! There are plenty of events that take place here year round. 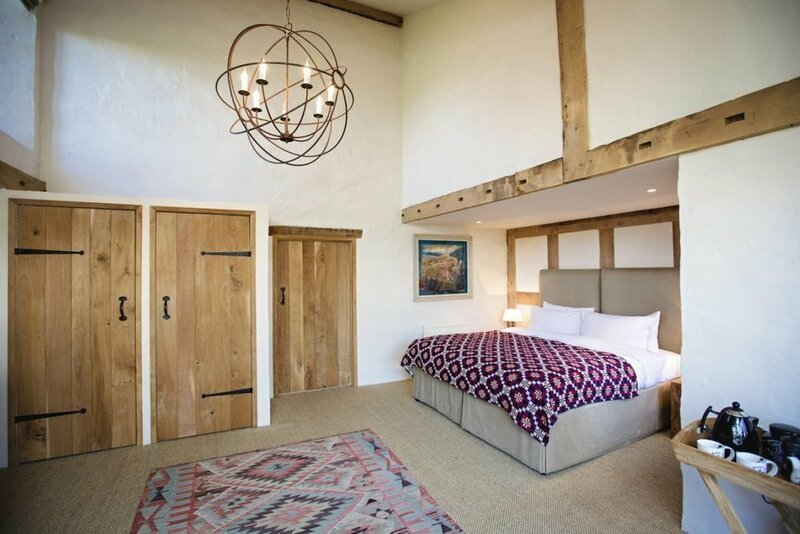 Dewsall Court is in partnership with Pol Roger who sponsor many events, including the recent Raising The Barn party to celebrate the renovation of the Wainhouse Barn. The next fab event is their “Furs, Fire and Ice” party on December 15—it’s THE Christmas party to attend and they’re already more than 50% booked. It sounds absolutely amazing! Dewsall Court is special and deserves a tad bit of mystery and exclusivity. Commercialising it any further or doing mainstream advertising would just take away from the charm and appeal of this private country house. But if you do have the opportunity to attend an event here or know someone who knows someone…drop everything you’re doing and GO! And let’s keep this our little secret, shall we?